When was the last time you went to work and laughed all day? For franchisers in the child based sector all over the UK a day at work is never a dull day! There are more than 13 million children living in the UK alone, so is no surprise that child-based franchises have become the most popular franchise opportunity for people to invest in. Franchisor Mark Goode believes that the child-based sector offers huge opportunities, as parents are always willing to invest in their child’s education and health. Having a franchise in the child base sector goes above and beyond the financial rewards as your business will help children to learn, grow and develop and to also help tackle child obesity in the UK. You may think that you need to know everything about Yoga in order to become a YogaBugs franchise but this is not the case as you do not need a yoga background to become a YogaBugs franchisee. In fact, when Mark Goode started out as a franchisee he didn’t fully understand what yoga was, if you’d said to me three years ago that Id be involved in child yoga I would have looked at you very strangely, he now jokes. Now CEO, the business model Mark developed in his own franchise was so successful that the entire network adopted his approach. He says: I loved the company so much I bought it myself! Mark then went onto develop the Bugs Group and introduced FootieBugs, which teaches football skills in a fun an innovative way. These children’s franchises are a perfect fit for people who are commercially minded and want to develop a thriving business. Mark explains that a franchise for any one of these companies will suit entrepreneurial, business-minded people who want to follow a proven successful method. Prospective franchisees should be business minded first, and then the passion for the product comes alongside it with anyone of our franchisees, says Mark. Child-based franchises such as YogaBugs are seen as mainly a female-dominated industry but are increasingly attracting men. Fenella Lindsell founder of YogaBugs explains YogaBugs used to be seen as a mainly female dominated industry but we are getting more men coming through. Especially the younger ones that have been working in the Yoga industry and are looking for other opportunities. Mark Goode adds were also getting husband-and-wife teams that are very much interested in investing money into a child-based franchise as they want to be able to pick their own destiny rather than just solely relying on jobs that may not be secure in as little as 5-years time. This sense of reward and achievement is often the very core of why people want to get involved with working with children. For Mark Goode, YogaBugs transformed his outlook on life: It actually changed some of the relationships I had with friends and family you start to appreciate things more because you see that you are in a world where not everybody has what you have. It grounds you. A business franchise that helps child development, education, social skills, and helps to keep a child fit, active and healthy often attracts interest and support from the Government, which can help massively to increase interest and demand for a business such as YogaBugs and FootieBugs. Mark explains, “The Government announced new funding for schools with sport and PE premium, for the next academic year. The money will be given directly to primary schools in England, and this can be used in order to pay for extra coaching sessions to improve the quality of sports and PE provision in schools across the UK.” This is great news for YogaBugs and FootieBugs. A position of such high priority on the Governments agenda can only be beneficial for a franchise such as YogaBugs and FootieBugs. It would be impossible not to feel inspired by child-based franchises, which can provide education, fitness and emotional development for children. So why not listen to your inner-child and return to a child-like happiness by working with children today! Franchise opportunities are available today…why not take the next step? YogaBugs; Great fun, serious business! There have been countless studies that prove and demonstrate the health benefits of yoga. It is practised by many superstars who openly promote the benefits. From fibromyalgia to colds and the flu, yoga is great for the body. Pain relief, increased strength, and a stronger immune system are all side effects of a regular yoga practice. Researchers may not be sure why yoga has some of the effects it does, but those who practise yoga are happy to enjoy the benefits. Many people are also inspired by their yoga practice to improve their diets, to get more sleep, and many other healthy lifestyle choices. YogaBugs takes this to the next level by actively supplying its customers with information to support a healthy lifestyle beyond the yoga class. YogaBugs is aimed at children and improving their lifestyle. YogaBugs unique Child Development programmes take children on wild adventures using the medium of yoga. Not only do children get all the usual health benefits associated with yoga, YogaBugs also enhances their literacy, numeracy, self-esteem and social development. Yoga is a real fun activity and has great benefits both physically and emotionally. Yet more needs to be done to give more children access to this unique and totally inclusive form of exercise. But who can do this? YogaBugs franchisees are able to take the ground breaking programmes and deliver it to children on mass. This is because YogaBugs is a management business opportunity. One yoga instructor can only teach one class at a time. Six instructors however can teach six classes at a time. A YogaBugs franchisee does not need to be a yoga instructor themselves. Simply just have a passion for yoga and for helping children. Franchising is not for everyone, but for those who want a short cut to running their own successful business it can be a dream come true. YogaBugs are an internationally recognised franchisor with 10 years experience. With a tried and tested business model, YogaBugs could be the perfect opportunity for you to take control of your own future. Yes yoga is fun, but for the right person a fun pursuit could also be a serious business opportunity. YogaBugs are committed to finding the right individuals and offering them first rate training and support. Did you know… every governmental report on children’s health highlights the need for what YogaBugs offers and with schools being given funding to improve Primary School PE, YogaBugs is always on top of the game. Unlike other children’s activities YogaBugs franchisees benefit from offering a bespoke child development programme, called Impact and Change, to schools and nurseries. This is results driven and adds extra value for Ofsted. This programme contains class plans around key texts and best of all can be tailored toeach school and at the end of the programme a report is produced detailing the individual and group improvement of the children involved. YogaBugs is perfectly placed in the Education sector offering a programme that develops children both emotionally and physically which is why schools keep booking us. Want proof? Check out what our customers say here! You do not need to be a yoga expert to become a YogaBugs franchisee, you just need to be motivated and ideally come from a previous sales background, have a good head for business and a desire to inspire children to be physically and emotionally active. If this sounds like you, get in contact today! When the clock strikes midnight on December 31st many of us resolve to live healthier better lives. YogaBugs want to help you this New Year and so here are our Top Ten 10 Tips to a healthy 2014. 1. What Does The Cat Do? The hit viral song of 2013 was What Does The Fox Say, in 2014 we want you to ask what does the cat do? When a cat wakes up it stretches. Learn to stretch with yoga as soon as you wake up. This will aid circulation, digestion and ease back pain. 2. Let your emotions out. Having a cry is good for you. So is having a good laugh. Studies from Japan have proven that laughter in particular can boost the immune system and help the body in fighting allergic actions. 3. Eat your most important meal of the day. If you miss breakfast you can expect to put on weight. The good news is you can eat loads for breakfast as long as it is the right stuff, such as fruit, yoghurt, high fibre cereal or brown toast. Fill yourself up and avoid the desire to snack later in the day. 4. Give your mind a work out. People who develop their mental agility tend to have lower rates of age related mental decline. Simple things like brushing your teeth with your other hand can make a big difference. This will energise your brain. 5. Judge a food by its cover. Always read the label in the supermarket. See what the products contain as understanding what is in your food will help you make healthier choices for you and your family. 6. Take stress for a walk. When you are feeling the pressure, get out and go for a walk. It will clear your mind and give you space to put your thoughts in order. If it is a brisk walk it shall also count as exercise. 7. There is no substitute for exercise. Quite simply 30 minutes of aerobic activity for 5 days a week will help you burn those calories and look after your heart. Fit it in when you can. Just make sure you do it. 8. An apple a day keeps the doctor away. You may have heard it many times, but in terms of diet your five a day is perhaps the most important thing you can do. 9. Enjoy a sweet treat. When you finish dinner and need something sweet. Do not despair simply swap high sugar fatty deserts for diet jelly with natural yoghurt. 10. Do it for at least 8 hours a night. Sleep is really important. It is when your body and brain recharge. You need at least 8 hours a night. Do all you can to make sure this happens. What will it take for people to get the message? This week The Sunday Times obtained some seriously scary information in a Freedom of Information Request from Newport Council. In August 2012 a five year old girl was taken into care because she weighed more than three times the weight of a healthy child her age. The girl weighted 10st 5lbs. Newport council issued a statement saying, “a thorough assessment of the child and the family is always considered in cases like these.” In October 2012 the girl’s weight rose to 10st 10lbs, but had fallen to 7st 7lbs by August 2013 while she was in care. This extreme case highlights the bigger problem of childhood obesity. A spokesperson from Public Health Wales, said “fast food advertising, especially for high fat, highly processed foods, as is the amount of fast food outlets in more deprived areas and a lack of play spaces for children,” were at the root of the problem. Parents have passed the consumer culture onto their children. They are finding it more and more difficult to say no. The current economic climate does not help the situation either, with a Bargain Bucket growing in appeal for cash strapped families. The cost of living is increasing and wages are not matching it. Times are tough and families need help. This can be done financially by the government, but organisations such as YogaBugs also have a role to play. The role is one of education. Both for the children and the parents. YogaBugs encourages children to do physical exercise. The beauty of it is the children do not see it as a chore or task to be completed, they are in fact playing. Whilst doing the physical exercise of yoga, the children are participating in stories and going on wild adventures. There are many benefits of children’s yoga, such as improved concentration, but the YogaBugs programme is specially designed to also develop numeracy, literacy and self-esteem. YogaBugs also support the parents with booklets on exercises for home and the YogaBugs Fun Zone has some great stuff to help parents keep their children healthy. Keeping children healthy is the responsibility of everyone. The poor girl in Newport was let down by everyone who came into contact with her. Surely somebody could have prevented a situation where a child is taken into care because they are severely overweight. if you would like to help keep children fit and healthy, could you run a YogaBugs franchise? YogaBugs are looking for the right people to join their network and help more children be physically and emotionally active. Make a positive difference! What do you buy the child that has everything? Finding the right gift at Christmas can be difficult, finding an original gift even more so. Yet creative parents across the UK seem to have found the perfect solution. YogaBugs. “It has been quite surprising. We have had a nice upturn in visits to the website and bookings for the New Year, with parents or close family booking children into classes as Christmas presents. They are looking for something that lasts way beyond Christmas, something more than just a toy.” said a spokesperson from Bugs HQ. YogaBugs is a unique children’s activity devised by the consultant to hit CBeebies show Waybaloo, Fenella Lindsell. The sessions take children on wild adventures where they can be lions, jungle explorers or pirates. This is all done through yoga postures giving the children a physical workout by stealth. The sessions also have hidden benefits as the classes have been devised to also improve literacy, numeracy and self-esteem. The sessions are really inclusive and accessible to all. All YogaBugs instructors are qualified, highly trained, well motivated and CRB checked. This is why parents across the UK see YogaBugs as the perfect antidote to games consoles, tablets and DVDs. A fresh faced Ryan Giggs, who is still going strong at 40 because of yoga. Ryan Giggs is hoping to make 1000 appearances for Manchester United. Giggs has spent the last 3 decades representing Manchester United, playing a key role for arguably the world’s most successful club. The reason for his longevity? Yoga. 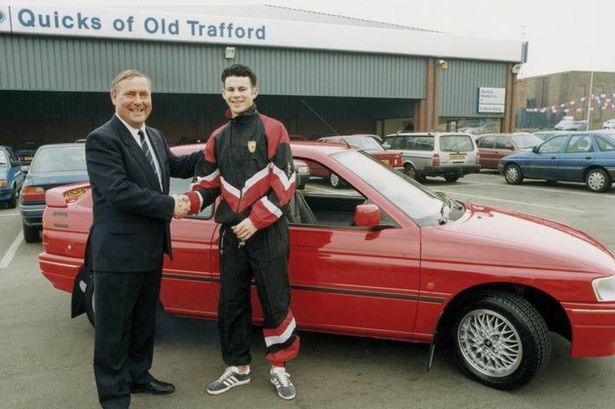 Giggs was committed to being successful and as such would go to any length to extend his career. For example, he stopped driving sports cars because of their impact on his hamstrings, improved his diet and retired from international football. All these things have helped him play for United until the age of 40. It is however yoga that Giggs, gives most credit too. Although always opened minded Ryan Giggs, was sceptical at first about some of the yoga practices. Yoga was typically associated with mums and for a Premier League footballer this was certainly a bold and brave move to break with convention. He could not see the benefit to him to stretch in this position or that. Then he was shown stills of how he would contort himself on the pitch, albeit unwittingly, and it all made sense. The results have been emphatic. Ryan is still playing regularly at United and the Old Trafford legend has 1000 appearances firmly in his sight. It would be foolish to bet against him. YogaBugs are putting yoga into schools across the UK. Not only are children benefiting from the physical exercise in the way that Ryan Giggs has, due to the unique nature of the programmes they are also improving their literacy, numeracy, self-esteem and social skills.